Last week, I had a great menu planned. I managed to cook the pork roast, which was tender, juicy, and delicious. The rest of the week, I somehow ended up eating out quite a bit. Here’s what happens. I get home from work very hungry. I see a kitchen with dishes that need to be washed. I’m tired. I don’t want to bother with cooking. Then, I end up eating out, because it’s easier (not on my budget, though). This weekend, I decided to make sure that I would have food to eat when I got home from work. We (my husband, 2 visiting family members, and myself) were going to go hiking on Saturday (which we did, and it was a lot of fun), so I purchased 1 pound each of turkey and ham on Friday night. I came home and made 10 sandwiches. We used four sandwiches, so the rest will be for our lunches this week. On Sunday, I went ahead and cooked our dinners for the week. I ended up cooking some of the foods that I had planned to make last week! I made spaghetti with chicken, chicken noodle soup, and chicken fajitas. 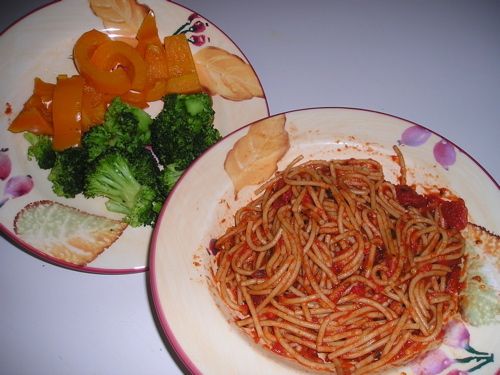 I also steamed broccoli with an orange bell pepper to go with the pasta, and sauteed an onion and orange bell pepper with garlic, cumin, and paprika for the fajitas. The sauteed veggies will still be left when the fajita meat is gone, so I’ll probably use them with remaining tortillas and a can of black beans that I have on my pantry shelf. In an effort to make dishes that follow my diet, I’ve found that I need to use more meat than what others might use. With the sandwiches, I tried to use about 4 oz of turkey or 3 oz of ham per sandwich. I also used 2% cheese and light bread. I doubled the amount of chicken I normally use in the chicken noodle soup (I used 2 chicken breasts this time), so that I would get about 3-4 oz of chicken in a bowl. The same applied to the spaghetti. I used 1/2 pound of ground chicken and 1/2 pound of sliced chicken tenders that I had in the freezer. When looking for a book to review as an example of a fancy book report for my students to use as a guide when they do their own book reports, I thought of author Nevada Barr. She has a new book coming out April 1. It’s called Winter Study. I decided to review High Country, because I was looking for a book that I had a lot of personal connections to. I wanted to write about my connections, so that my students would include connections in their own book reports. This book is the twelfth Anna Pigeon novel by Nevada Barr. In almost every book, Anna is at a different National Park. There’s always a crime for her to solve. In the beginning of High Country, park ranger Anna Pigeon arrives at Yosemite National Park. She’s a law enforcement park ranger who is undercover to find out why four employees have disappeared. In the middle of the book, Anna’s undercover job is posing as a waitress at the park’s restaurant. The problem is that Anna is a terrible waitress. Meanwhile, she has to investigate the mysterious disappearances of the park employees. Near the end of the book, Anna has to go on a very long hike into the wilderness of the park, because she has an idea of why the park employees disappeared. Armed with pocketfuls of granola bars, Anna sets off alone into danger in the woods. High Country takes place at Yosemite National Park during present day. Readers are introduced to the park’s historical buildings, jobs that park employees have, as well as the best hiking, camping, and rock climbing sites in the park. I connected to Anna in many ways. As a child, I used to visit national parks every summer. It’s great to imagine the beauty of the park as the author describes every detail. I feel like I’m in the mountains with Anna. I’ve always wanted to be a park ranger. Through Anna’s adventures, I get to live out my dream. Anna deals with campers, views wildlife, and gets to go on amazing hikes. When I read about Anna’s adventures as a park ranger, as well as Nevada Barr’s beautiful descriptions of our national parks, I am inspired to write my own novels about park rangers. I’m also encouraged to get out into nature and hike, bike, swim, canoe, crawl through caves, and just sit under a shady tree with a book down by a river. It’s always a wonderful and inspiring experience reading a Nevada Barr book. Anna Pigeon is a very independent person. She’s also very tough and brave. No matter how dangerous a situation is, Anna always manages to hold on, persevere, and pull through. For example, when Anna gets hurt, she continues to work on her own to save someone who is in danger. Anna’s also a very loving person and a good friend. She has a dog and a cat who she misses when she can’t be around them. Her dog is also a great companion when Anna wants to walk around campsites to meet with park guests. This is her secret way of not letting them know she’s a law enforcement park ranger. That way, the park guests will talk to her like they would any other park guest. Anna is very intelligent. Through research, observations, interviews of people, and general police knowledge, Anna makes a very good detective. She always figures out who is causing problems and she catches the bad guy by the end of every story. I’m making a construction paper cube and attaching each section to a different side. It will make a great book report that can be viewed from four sides. When I came back from Spring Break, I didn’t make a menu and ended up eating out more than usual. This week, I was determined to plan and cook at home more. When I’m not cooking (working, or exercising) this week, I have good intentions to continue sewing my spring wardrobe. View my Sewing Saturday post (below) for what I’ve been sewing lately, then add your sewing posts to the Mr. Linky at the bottom of my post. Lunches will be served with fruit, vegetables, and other side items. For more Menu Plan Monday ideas, see I’m an Organizing Junkie. I’ve been doing quite a bit of sewing lately. I’m going to give information about each project that I’ve been working on since my last Sewing Saturday entry. This is the second shirt I did from Simplicity Pattern 3893. The first one had shorter sleeves. 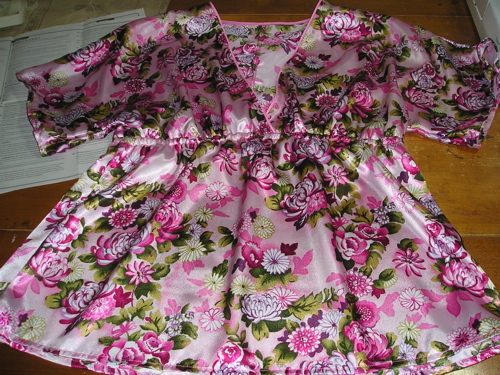 This is the third shirt from Simplicity 3893. It also has the longer sleeves, which are more appropriate for work than the first shirt I did from this pattern. 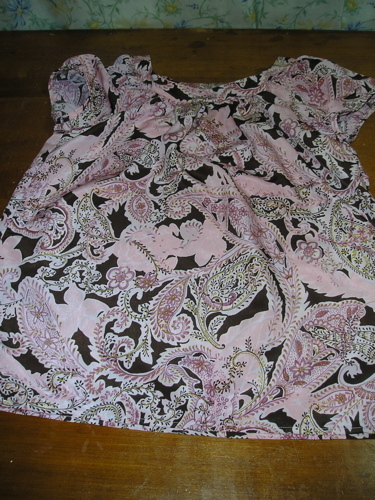 I used a silky fabric from JoAnn Fabrics for all three shirts. Thus begins the tale of The Mumu Dress, aka Simplicity 3681, View D. It’s the one on the bottom right of the 6 views. It’s also the longer version of the blue dress on the far right. 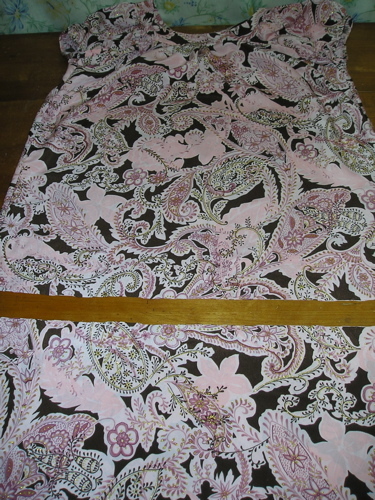 When I made this dress, I altered the pattern of the neckband to be narrower. 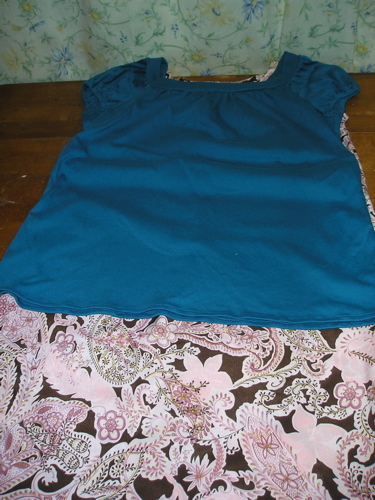 I did not want to have to pin the dress to my bra straps like I did the blue shirt I made (see picture below), which had a similar neckline, as well as dresses I’ve made in the past. I have a slightly-petite torso, so the neckline of some tops and dresses can “pop” out and not be flush with my torso. Before cutting out my pattern pieces, I made the neckline (roughly) with newspaper and tried it on. As I had suspected, it was too wide. My bra straps would have shown. I folded the pattern pieces to the smallest given size on them, and also folded the other ends in the same amount (about 1/4 inch). After trying another round at the newspaper pattern (My husband wondered what I was doing with his newspaper! 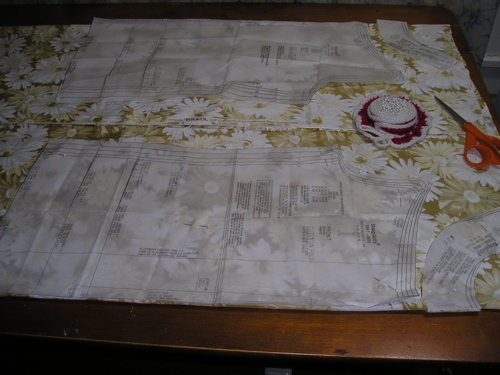 ), I felt slightly confident, a bit apprehensive, and full of prayer as I decided to just go for it and cut out the pattern pieces at the altered size. The neckline fit very well, although I did not enjoy the construction of it. 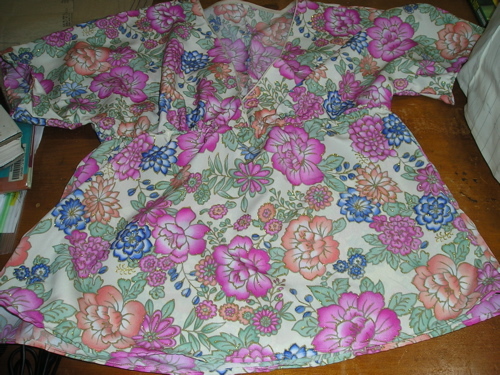 It involved folding over and sewing fabric “in the ditch” which means in a seam line, but the stitches didn’t always catch the hem (on the inside) very well. I had to go back and re-sew several parts of the neckline. That was not fun. The dress length did not work out so well either. The hem was not wide enough (or stretchy enough) to allow you to take large steps when walking quickly. Also, the dress resembled a mumu (someone else’s words, but I heartily agreed). Thus, I decided to butcher (Did I mean alter?) my newly-made dress. As the blue shirt I had previously made was very comfortable, a good length, a flattering color, and otherwise great (except for the fact that I or my husband had to pin it to my bra straps any time I wanted to wear it), I used it as the template to determine the length to cut the dress and turn it into a cute top. I ended up cutting 14 inches off of the hem and re-hemming it. Here it is finished. It’s now adorable, well-fitting, and comfortable. I can wear it with jeans on the weekend or with dress pants at work. I decided to redo the blue top (Simplicity 3887, View C, without the sash). This time, I altered the neck pattern pieces, just like I did with the mumu dress (now a cute top – see previous pictures in this post). To alter them, I once again folded the edges down to the smallest size printed on the pattern, and folded the same about on the other sides. On these pattern pieces, I had to fold about 5/8 inch in order to get the pieces the same size as the ones for the mumu dress. This is some golden-yellow and white silky floral fabric that I’m also using to make Simplicity top 3887 (same pattern as the blue top). I used the altered neck pieces here as well. What’s next? As this is Easter weekend, I’ve seen quite a few sales ads on TV for Easter dresses. 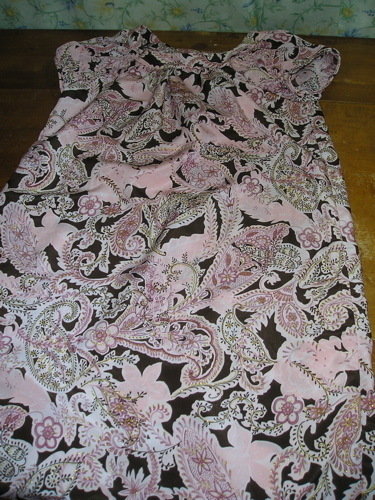 I’ve purchased fabric to make a dress pattern that I have. I don’t know if I’ll get to it this weekend or not. I want to make the two tops (blue redo and golden flowers) first. Also, like any new pattern, especially dress ones for me, I don’t know how it will turn out. 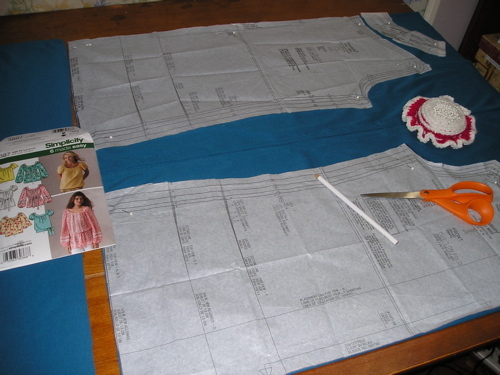 As I mentioned previously in this entry, many dress patterns end up with an ill-fitting bodice. We’ll see! What have you been sewing lately? Add your link into Mr. Linky below. Make sure to mention http://www.learningtobefrugal.wordpress.com in your post. When you’re done, check out the Mr. Linky site. I recently purchased some steamable re-sealable bags. The reason was that I wanted to buy some frozen cauliflower. The only package that was cauliflower only (not mixed with broccoli or something else) was a steamable bag. The problem was that you had to cook the entire bag at once if you wanted to steam it in the bag. I knew that I didn’t want to eat broccoli several days in a row, so cooking the entire bag was not an option. 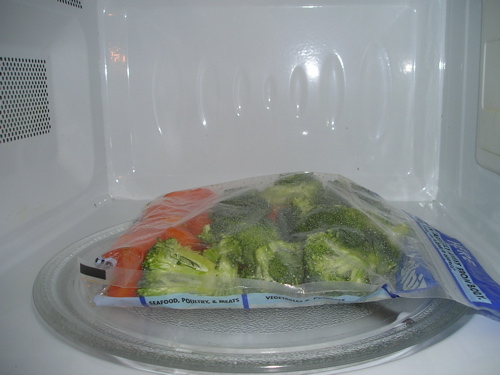 I decided to go to the baggie aisle and got a package of re-sealable steam bags for the microwave. I was so pleased at how they worked out. The package even included recipes and a variety of cooking times. There was no guesswork involved, which was great. For lunch today, I sliced an orange bell pepper and some fresh broccoli. I also added light salt and garlic powder. 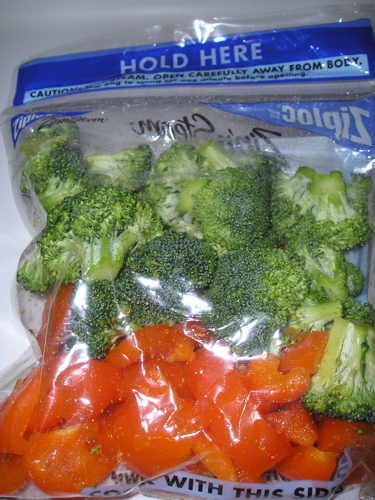 After shaking the bag to mix everything up, I sealed the bag, spread everything out, and microwaved it for 3 minutes (The other side of the bag listed 3 minutes as the cooking time for a full bag of broccoli.). I used half of the cooked peppers and broccoli for my lunch. 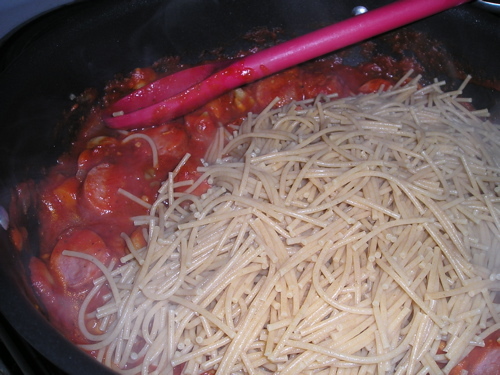 I also heated up some leftover pasta (just wheat spaghetti and marinara sauce) to go with it. Yum! In the past, my gardening skills have shown me to be more adept at planting than in the life-support of plants. Thus, I decided to stick to a very small garden this spring. I removed the large, falling-apart garden boxes from the side of the house where the shade kept things from growing properly. Add to that the fact that they were located at a distance from the water spigot that outdistanced the length of the hose (I purposely have a short garden hose so that it doesn’t completely cover the walkway when coiled up on the ground), so that a bucket had to be used to water the plants. Anyways, I went to my garage (Shop at home, first!) and found two boards. After sawing them in half, I followed the directions in the All New Square Foot Gardening book by Mel Bartholomew to build a new garden box. The box measured 2-1/2 feet by 3 feet. To make Mel’s Mix, which is the soil mix prescribed in the book (although any misconceptions and mistakes in making it are all my doing), I purchased and mixed 2 bags of compost, 1 bag of peat moss, and 1 bag of vermiculite. To mix them, I used an old tarp from the garage, folding edges over to mix the soil. After filling the box, I put the remaining soil mixture back in the compost bags (it filled both). 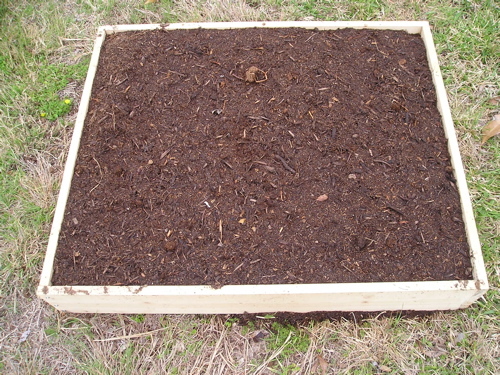 If this box works out (as in I keep the plants alive and feel that I can handle another box), I can always make a second box and use the saved soil mixture for it. I went to the plant nursery and purchased a 6-pack of strawberry plants. I’ve always wanted to grow strawberries. Plus, the 6-pack was much cheaper than buying a few singles and then some additional plants (like tomatoes or peppers). 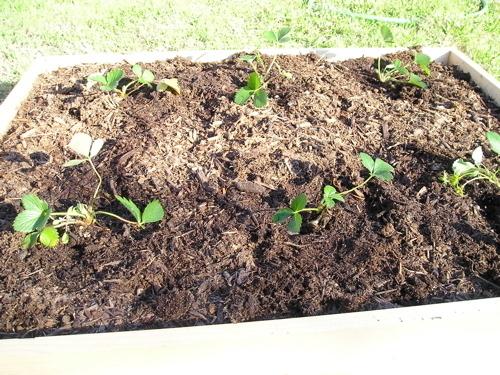 Here is a closeup of one of the strawberry plants. 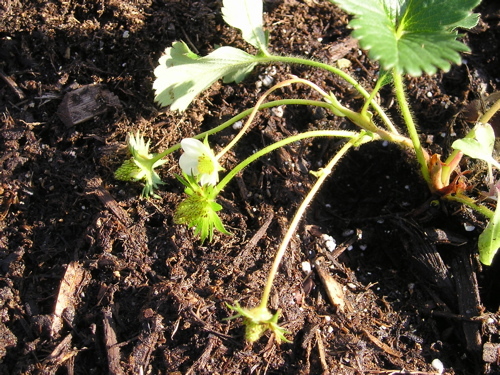 You can see some baby strawberries growing, as well as a white flower. 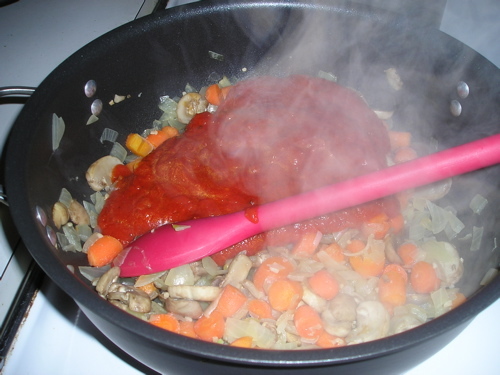 Following are pictures of when I made pasta with turkey sausage. 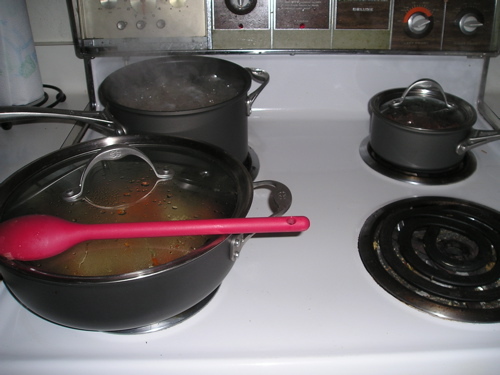 Anyways, I’ve just gotten everything started on the stove. 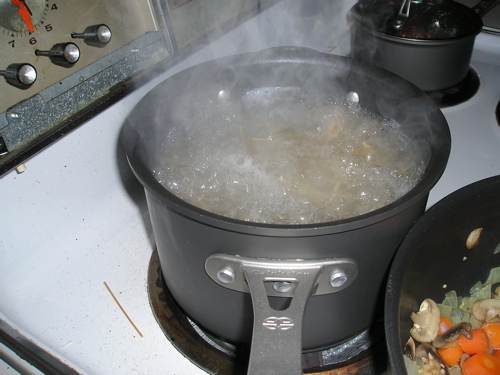 The pasta (whole wheat spaghetti) is boiling with a little bit of EVOO and light salt in the water on the upper left burner. It will go for about 10-12 minutes. 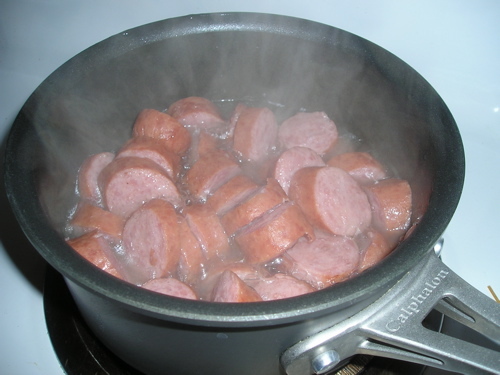 The smoked turkey sausage has been sliced into rounds and is simmering with about 1/2 cup of water on the upper right burner. That cooks for about 8-10 minutes (per package directions). 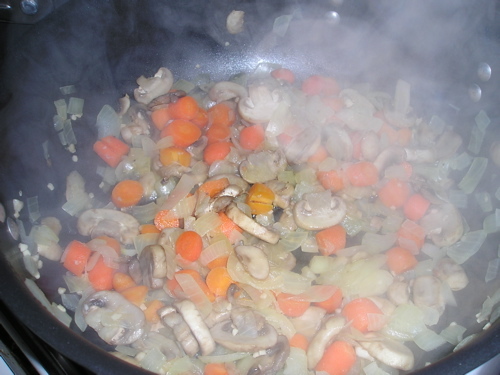 The bottom left pot contains EVOO, chopped garlic (from a jar), sliced baby carrots, 1 chopped onion, and pre-sliced mushrooms. I cook them over medium heat until the onions look softer and almost cooked. I also want the carrots to get a bit soft (if possible in that timeframe). This usually takes about 5-8 minutes. They’re not completely done, but well-enough to start adding additional things to the pot. 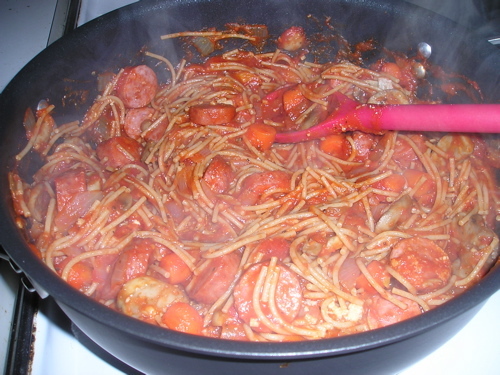 Here is the spaghetti. I break it up when putting it into the pot, so pieces tend to fly through the air and scatter. 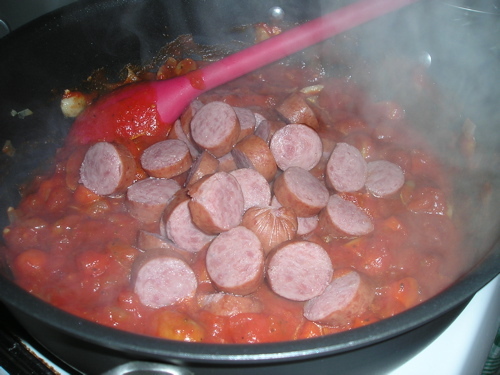 Here is the sliced turkey sausage simmering in water. 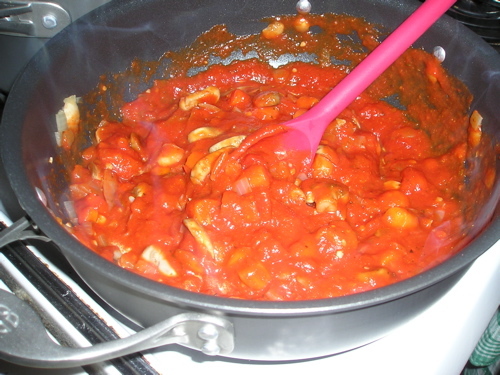 I’ve added about half a jar of marinara sauce to the vegetables. If I have time, I’ll make my own and freeze it in 2 cup portions (Giada De Laurentiis’s Everyday Italian contains a great recipe for marinara sauce.). I mixed in the sauce. Here, I added the turkey sausage after draining the water. 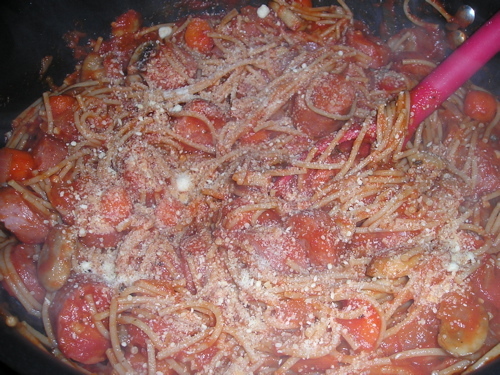 I added the drained spaghetti. Here, I’ve added grated parmesan cheese. 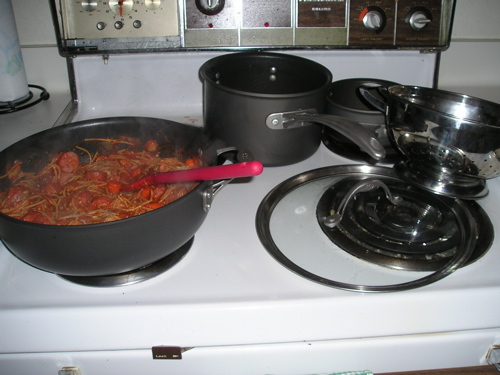 Thus, you have the completed pasta and a cook top of dirty pots. Here’s a close-up of the delicious pasta. Yum!